“Mile 22” is an intense thriller, but the story does not gel. There are many moving parts that don’t make sense. Nothing comes together, not even at the end. The story starts off strange and gets stranger as the movie moves along. There is no real back story to lend perspective as to what the CIA unit is about. There are several side-stories that don’t get enough air time to make any sense. There is plenty of intense violence, action and some military special ops type of action. Those are the best parts in the movie. I feel that “Mile 22” is a waste of some very talented actors. I had high expectations, but I am truly disappointed. 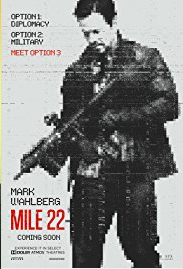 “Mile 22” is best watched on Cable. I would not purchase the movie on DVD or Blue Ray. This movie gets no Stars! !